Sleeping Well is Just the Beginning! 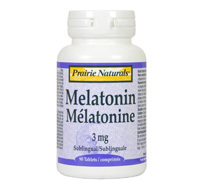 Melatonin is a hormone secreted by the pineal gland in the brain that helps regulate other hormones and maintains the body’s natural sleeping cycles. This safe, non habit-forming alternative to sleeping pills is helping millions of insomniacs. Taken at bedtime, it promotes a deeper and longer sleep. Recent research studies have also found melatonin helps lower blood pressure, reduce menopausal discomfort, prevent breast and prostate cancers, improve the symptoms associated with fibromyalgia and irritable bowel syndrome. It also exerts strong antioxidant effects and boosts immunity. Medications that can lower Melatonin levels in the body include*: calcium channel blockers, beta-blockers, nonsteroidal anti-inflammatory drugs (NSAIDs). 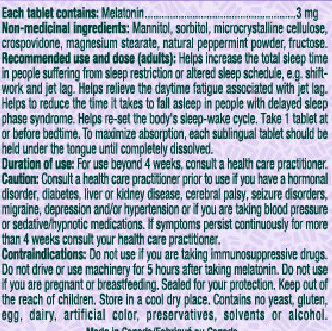 In addition to these medications, melatonin levels can also be depleted by the use of caffeine, tobacco and alcohol.